As I'm sure you've noticed, I have been MIA from my weekly pregnancy posts, and for good reason. A few weeks back, what would have been my 29th going on 30th week of pregnancy, I went into preterm labor. Let me preface this post by jumping to the end and letting you know that Peyton and I are perfectly fine and he was not delivered early, praise the Lord! Our little man is still baking in there and I have been placed on bed rest until I have reached 36 weeks. That could change and I could go into labor again, God forbid, or my bed rest could be extended based on these next few weeks, only time will tell. 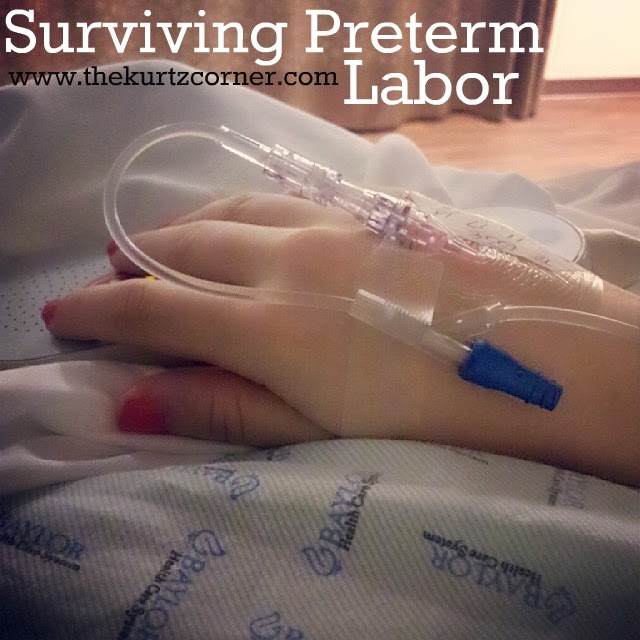 I decided to write this post for those of you who are following along with my pregnancy, for those that may experience the same preterm labor scare, and also for myself, to remember this time in my life. A lot of what took place over a five day span is still fuzzy to me. I have no recollection of time, but I can tell you that I was in my own personal Hell for what seemed like days. Everything started on a Friday, November 15th 2013 to be exact. I had been experiencing a lot of tightening in my stomach, which was really my uterus if you want to get technical. I had no idea what the feeling was since this is my first pregnancy. I had heard of Braxton Hicks, but didn't really give any thought to it. It felt like Peyton had turned into a giant rock and was just pushing himself as hard as he could all towards the front of my stomach so that it became a huge boulder. My whole stomach would tighten for a minute or two and then release. It would take my breath away, to the point that it felt like someone was clenching my windpipe, but I felt no pain, so I dismissed the feeling and chalked it up to the normal pregnancy symptom craziness. I went to bed that night, perfectly fine other than not being able to get comfy, what else is new? I woke up around 2:00 or 3:00am experiencing that same tightening feeling and had an overwhelming feeling that something wasn't right. I reached for my phone on the nightstand and quickly Googled "What do Braxton Hicks Contractions Feel Like." I confirmed that what I was feeling seemed to be Braxton Hicks, or so I thought at the time. They seemed to be coming more frequently which I had read was not a good thing. I then downloaded an app to time these contractions and found that I was having them way too frequently, about 6 or 7 in an hour. (You should definitely contact your Doctor if you are having more than 4 or 5 Braxton Hicks in an hour.) I immediately called the on-call physician who connected me to my Doctor who instructed me to go to my hospital. After reaching the hospital, I went through the usual hoops, answered all of the questions about what was going on, my cervix was checked (it was closed), and I was then promptly hooked up for an NST (Non-Stress Test) scan. NST scans are non-invasive test performed over 28 weeks gestation. The test is named “non-stress” because no stress is placed on the fetus during the test. The test involves attaching one belt to your stomach to measure fetal heart rate and another belt to measure contractions. After 20 or 30 minutes of monitoring they decided they would see if IV fluids would stop the contractions since dehydration can trigger contractions apparently. The IV fluids did not stop the contractions, so I was given a shot (I cannot for the life of me remember what they called it) to stop the contractions. Finally, the contraction slowed, I was monitored for a while longer and then was sent home around 10:00am. Needless to say we were both exhausted and crashed as soon as we got home. Fast forward to 10:00pm Saturday night, cue the contractions. Again, timed them, called my Doctor and was instructed to go back to the hospital. This time, I was taken to an actual L&D room, hooked up for an NST scan, my cervix was checked again (PS having your cervix checked hurts like a motha!!) and that's when the panic began. I had dilated 1cm and it was confirmed by the NST scan that I was indeed going into preterm labor. Of course, 29/30 weeks is way too soon to deliver, although there is a 95% chance of survival, it's not a risk worth taking if you can stop preterm labor. My Doctor decided that the best route to go would be to start a Magnesium Sulfate treatment for the next 24 - 48 hours. According to Web MD "Magnesium sulfate is most commonly used for the treatment of preeclampsia during pregnancy. Use of magnesium for the treatment of preterm labor or preeclampsia is an unlabeled use of the medicine." With no time to research, I had to trust that my Doctor knew what she was doing. Our hopes were that the Magnesium Sulfate would stop the preterm labor and, if not, that it would delay delivery by 24 - 48 hours so that I could be given corticosteroids to help Peyton's lungs mature. I was placed on a drip of the Magnesium Sulfate, receiving 3g per hour. Immediately, I felt the side effects. I'm talking instantaneously. My whole body flushed and I felt like I was on fire, literally! My body felt like it was burning from the inside out, like I was sitting next to a roaring fire and there was nothing I could do to get away. The next thing I knew I felt nauseous and no sooner did the nurse hand me a vomit bag I started throwing up. The next 36 hours was pure and utter Hell. Time stood still and I felt worse and worse by the minute. I opted out of having a catheter and decided I would use the bed pan...I know TMI, but this is key and you'll read why in a little bit. As time passed things got worse. I couldn't focus my eyes, I was freezing yet sweating and burning up like crazy, my throat was dry and it hurt to swallow. I became weak and slowly my reflexes were getting worse. I remember thinking to myself, "I must be dying" and I honestly believe that my body was shutting down. Finally, it got to the point where I could no longer lift myself off the bed to have the nurse slide the bed pan under me, I couldn't lift my arms, I couldn't open my eyes, I could barely speak, I couldn't close my mouth, I had no reflexes, and it was becoming hard to breathe. At the point were I could no longer lift myself on to a bed pan (or actually pee for that matter) the nurse finally pulled me off the Magnesium Sulfate and called the doctor. I was stuck several times to try to take my blood to test the Magnesium Sulfate levels (my veins are tiny and hard to find), which came back at a level of 10g in my system. 10g is after my drip had been reduced to 2.5g per hour...the therapeutic zone for this kind of therapy is 5g-7g....I WAS AT 10 GRAMS!!! We were told that everyone metabolizes Magnesium Sulfate differently, which is why mine had gotten so high. I was so angry! Why had I not been tested hourly to make sure my levels stayed in the therapeutic zone!?! A question that was never answered. Coming off of the drug was just as horrible. I imagine this is what strung out drug addicts feel like when going through withdrawals...pure Hell. My sweet husband stayed by my side spoon feeding me ice chips to soothe my throat so I could swallow and covering my face and neck with cold washcloths until they were hot because my body was radiating so much heat. I bet he changed them 50 times. I'm sure I have left out portions of the 36 hours that I can't remember, but all I know is the treatment worked, Peyton is perfectly fine and I NEVER want to go near Magnesium Sulfate again. I am so thankful that it worked, but dear God I never want to have to go through that again. Of course, my amazing mother came running as fast as she could (she lives 3 hours away) the minute I told her I needed her. My husband was doing a fantastic job, but sometimes you just need your mom. Plus, I knew he was exhausted, needed to rest for work, and this gave him the chance to go home and sleep in a real bed while my mother stayed with me for the next two days in the hospital. I was finally released from the hospital a few days later on Wednesday after close monitoring. I was placed on bed rest until I reach 36 weeks (the day after Christmas), and now I must go to the Doctor twice a week for two NST scans and one sonogram until I deliver. I have a sneaking suspicion that we will be having a Christmas baby or maybe a New Years baby. We shall see! I know this was a super long post, but I hope that if you take anything away from my story, it's that you should always ask questions and ALWAYS voice your opinion when you feel like something isn't right with your body. I could have ignored Braxton Hicks and I could have just assumed that the way I was feeling on the Magnesium Sulfate was normal, but I didn't. Looking back, I could have been more forceful and insistent that I needed to have my blood checked, something, anything to prevent me from reaching 10g, but hindsight is 20/20 and there was no way for me to have even guessed that's what was happening to me. So, for the next few weeks, I will be resting as much as possible to keep our little man baking for as long as possible. Luckily, my Doctor has told me that I can leave the house every now and again just to get out and not go crazy. However, if I do leave the house it must be somewhere where I can sit, aka; if I'm going anywhere, I either need to be in a wheelchair or sitting. So, it looks like lots of movies, TV shows, blogging, knitting, surfing Pinterest and working on YouTube videos are in my future. I don't think I'll be doing any more weekly bump pictures, but we'll see. As always, I'm happy to answer any questions if you have them and if you've gone through a similar situation I'd love to hear your story! SO glad to hear you and your little boy are all right! Thank you for sharing your story! Praying for your pregnancy and bed rest to go smoothly and for your healthy baby. Sorry to hear you went through this but know it will all be worth it soon! Stay positive! Audra, first connecting on your blog. I have 5 kids...went into pre-term labour with baby 3 @ 20 weeks - 4 @ 28 weeks & 5 @ 32 weeks. I can honestly say that I went to term with each child. After baby # 3 I began to understand my body a little bit more. I wish you luck in your pregnancy and I would love to follow your journey until you give birth and beyond. God bless! I wish you a lifetime of love with your baby! I am so happy that you and your baby are OK! I had my teeth clenched reading the entire post, and then finally could relax once it was over! How scary?! Ugh I am sorry you had to go through that, but still glad you guys are okay!! Try to enjoy the bed rest! I know that sounds silly, but think of it as a vac a--having been on bed rest before, it's easier to do if you convince yourself you want the break. Randomly found your blog through a website tutorial and am glad I did. Love the fun crafty projects but more so I am glad that I can be praying for you and your little one after reading this blog post! I went into preterm labor with all 3 of my babies. Unfortunately I was 23, 17 and 21 weeks and they couldn't stop my labor. But I am SO SO SO thankful that your little guy is further along and you won't have to experience the worst part of preterm labor. I also had to go on Magnesium sulfate and yes, it's a pure nightmare! I was in a 'coma' for 3 days and have NO idea what happened to me in that time. (I do remember my husband coming in after work one day and his head was shaved but that was it. hahaha) I, however, LOVED the catheter b.c I didn't even have to THINK of getting up to go potty! I am praying for you now that you will meet your little guy face to face when the time is right and you will get to watch him grow into a strong young man. It's truly a miraculous journey. Though our babies didn't survive, we went on to become foster/adoptive parents and now are the proud parents of 3 amazing, beautiful boys! The day I held each of them for the first time as newborns I was so honored to be given the opportunity to experience the outcome of the miracle of birth.